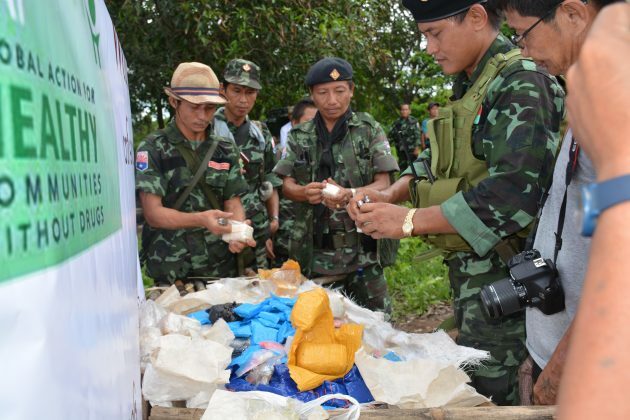 The Karen National Union’s Taw Oo [Taungoo] district burned seized methamphetamine pills worth 400 million Kyat (around USD $350,000) in an event to mark the international Day against Drug Abuse and Illicit Trafficking that was held on June 26. The event was held by the KNU’s armed wing, at the Karen National Liberation Army 2nd Brigade controlled area in Tantabin Township in Taw Oo [Taungoo] district. Padoh Saw Eh Wah, KNU’s Taw Oo district chairperson, told Karen News that the drug issue has become more of a concern in the last two years. Speaking to Karen News, Padoh Saw Eh Wah said. The destroyed drugs consisted of 111,537 methamphetamine pills. The event was attended by as many as 150 people including, Padoh Naw Myaing Po, the chief judge of the KNU central area, Padoh Saw Liston, a member of KNU central committee, Padoh Saw Eh Wah, Brigadier Saw Jaw Maet, vice-chairperson of Taungoo district, Nan Win Kyi,chairperson of Pa’O National Libration Organization based in Htandabin Township, U Htay Lwin, a member of parliament from Htandabin constituency (2), committee members of Pa’O Literature and Culture Committee, village chief adminstrators and the locals residents. Padoh Naw Myaing Po, said, “As the KNU has led the Karen revolution for all the Karen people we have the responsibility to protect our people from the danger of drugs. So we, the KNU, together with all our people carried out this anti-narcotic drugs activity for the International Day against Drug Abuse and Illicit Trafficking. Padoh Naw Myaing Po said women usually carried the burden of drug abuse and urged women to be involved in the anti-drugs movements. Nan Win Kyi, chairperson of the Pa’O National Liberation Organization from Tantabin Township said that narcotic drugs can be bought easily in Taungoo district. She said that it would be more effective for anti-narcotic drugs movements if grassroots ethnic people took part. The KNU seized the illicit drugs from both dealers in the area or from people who trafficked the drug through its territory. Officials said that all charges were filed under the narcotic drug law 1/2014 issued by KNU.